COMMENTARY ON "Christ in the Heavenly Sanctuary"
This week’s lesson is another example of Adventist obfuscation. In fact, the point of the lesson is to cement into Adventists’ minds their doctrine of the investigative judgment and Jesus continuing (not having already completed) His atonement for sin in heaven. For Adventism (derived from Ellen White) to say that Jesus’ divinity was quiescent during any part of His incarnation including his gestation and his burial in the flesh is to completely miss the nature of divinity. To be sure, Ellen White emphasized these ideas, but the Bible does not. Divinity cannot be “quiescent” or it is not divinity. All creation holds together in Christ because He is the DIVINE CREATOR (Col 1:17). All the FULLNESS of deity dwelt in Him bodily (Col 2:9), and that included his death. Deity was not quiescent in spite of what EGW said about His deity being quiescent in the tomb with His body. Such an idea is absolutely contrary to God’s word and is blasphemous. To say Jesus never used His divinity to aid His humanity is a straw-man argument. He was always 100% God and 100% man. These were not two aspects of Himself which He could switch on and off or from which He could dissociate. This fact is a miracle we cannot explain, but it is a fact which assures us that Jesus could not sin because God cannot sin, and it also assures us that, as His miracles demonstrated, He had authority over nature, over demons, over life and death. He also was tempted in every way as we are yet without sin. He was not human with a switched-off divinity, demonstrating that we can avoid sin if we do what He did. He was not a human who proved He could be sinless and thus become qualified to be a sinless sacrifice. Now if perfection had been attainable through the Levitical priesthood (for under it the people received the law), what further need would there have been for another priest to arise after the order of Melchizedek, rather than one named after the order of Aaron? For when there is a change in the priesthood, there is necessarily a change in the law as well. Further, although Wednesday’s lesson quotes Hebrews 6:19-20 which identifies Jesus as a priest “after the order of Melchizedek,” it doesn’t explain how that difference affects Jesus’ priesthood. In fact, this week’s lesson open with a picture of Jesus in levitical high priest garments mediating incense over the mercy seat of the altar. Adventism profoundly and subtly teaches that Jesus is carrying out the duties of a levitical high priest in heaven. They never acknowledge that the jobs of a levitical high priest were completely fulfilled in Jesus the man, in His death and burial and resurrection and ascension to the right hand of the Father. Adventists are taught that Jesus’ intercession in heaven is analogous to the High Priest’s sprinkling blood in the earthly sanctuary, and they teach that Jesus is mediating His blood to remove all the sins of the saved which have been repented and forgiven. In fact, Jesus’ blood was mediated at the cross. His once-for-all sacrifice was FINISHED at the cross. It’s effects were FINISHED. Now, when we hear and believe the gospel of our salvation, that ALREADY FINISHED work is applied to us, and all of our sins, past, present, and future, are forgiven and removed. Moreover, Adventism teaches that Jesus’ blood carries the sins of professed believers into the sanctuary in heaven. They say the earthly high priest carried blood into the sanctuary that represented taking Israel’s sins into the sanctuary for forgiveness, and they say that Jesus’ blood similarly takes believers’ sins into heaven where they await removal when the sanctuary is cleansed. Both assumptions are wrong. Blood NEVER defiled the sanctuary, even in the Old Testament. Blood always CLEANSED. It’s sprinkling in the sanctuary represented cleansing, not defilement. The sanctuary was defiled simply because it was ON EARTH, and the nation of Israel always sinned. The blood represented the price for sin being offered in the presence of God—before the Mercy Seat—and thus making atonement for Israel. The sacrificial sprinkled blood NEVER represented sins being transferred or defiling the sanctuary, and Jesus’ blood NEVER transfers sins anywhere. Instead, it CLEANSES and COVERS sin. It does remove sin as far as east is from west, but it doesn’t reposition sins in heaven. Jesus is the only One who ever received our sins. He Himself bore our sins in His body on the cross. He Himself died the death those sins mandated. His blood CLEANSES us and opens a new and living way to the Father (Heb. 10:20). Jesus intercedes for us eternally, but He’s not apply atonement and blood. He is the mediator between God and men. He will ALWAYS be our Mediator, the One who makes it possible for us to be eternally alive with Him. 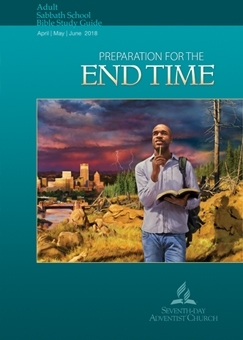 The lesson’s instruction about the anti-typical “day of atonement” beginning in 1844 and continuing until salvation is completed is utter heresy. There is no such thing, and the judgment on sin for believers occurred AT THE CROSS. When Jesus ascended He sat down—finished—at the right hand of God. His work is done! And when we believe, we are brought to life. God gives us new hearts, and our previously dead spirits—literally—are made new and alive and we are sealed by the indwelling Holy Spirit! This lesson teaches the central pillar of Adventist theology, and this “sanctuary doctrine” is patently false. It is not real, and it deceives people and keeps them from hearing and understanding the real gospel. Below are some links for further reading and viewing to help clarify this subject. Copyright 2018 BibleStudiesForAdventists.com. All rights reserved. Revised April 26, 2018. This website is published by Life Assurance Ministries, Camp Verde, Arizona, USA, the publisher of Proclamation! Magazine. Contact email: BibleStudiesForAdventists@gmail.com.